How to get ClaroRead Cloud out to your users. YouTube video of how to provision by linking from your website. You get ClaroRead Cloud services, like ClaroRead Cloud OCR and ClaroSpeak Web, through completing two steps. First, provision your own administrator account. Then decide how to provision your users (staff and/or students). You should have received a ClaroRead Cloud Licence Key for the apps and services you want to use. Contact sales@clarosoftware.com if you haven’t. Supply an email address (for resetting your password if you lose it). Go to www.clarosoftware.com/login and create a ClaroRead Cloud account. We recommend using a work email address corresponding to your institution domain name, e.g. admin@westhaven.eu for www.westhaven.edu. You will have to give the email address and password to anyone responsible for administering the Cloud account. Now you must enter your ClaroRead Cloud Licence Key to unlock the services and apps for this licence key. You can log in again any time to see usage information for your institution and staff, add more keys to unlock more services and apps, or administer services for your users. We want to make it as easy as possible for your users to access ClaroRead Cloud. You have two options. You can link ClaroRead Cloud to your own website, which is more work for you to set up but easier for your students and staff: or you can simply create a username and password to give out to anyone who needs it. Link directly from your website to the URLs provided in Manage Referrers. If in doubt, use ClaroSpeak Web. 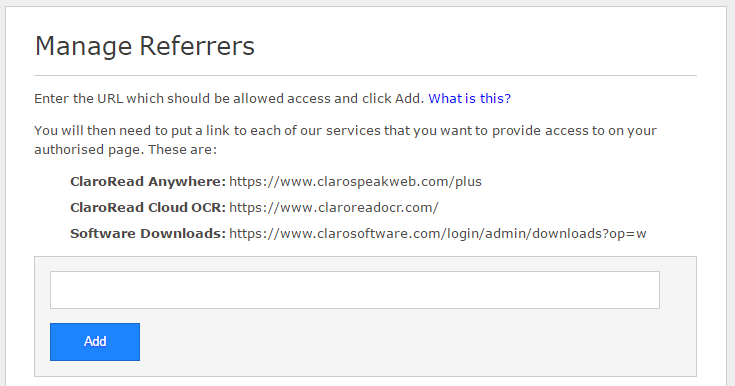 On your webpage where you want to link to ClaroRead Cloud, put a link to https://www.clarospeakweb.com. Follow the link and you’ll see the ClaroSpeak Web sign-in page. Do View Source in your web browser. Immediately after the body tag you’ll see an HTML comment with the referrer ID from your web page. This is the value you put into Manage Referrers. You can get more information about how the referrer URL is used by clicking “What is this?” in Manage Referrers. You can track usage across all your users in ClaroRead Cloud, but you will not be able to break out individual users. You may find it simpler to have a username and password to give out to your users. You can get this from your admin Cloud account. Log in to ClaroRead Cloud. Click on Student and Staff Access. Set the password you want to use and (optionally) change the default username. 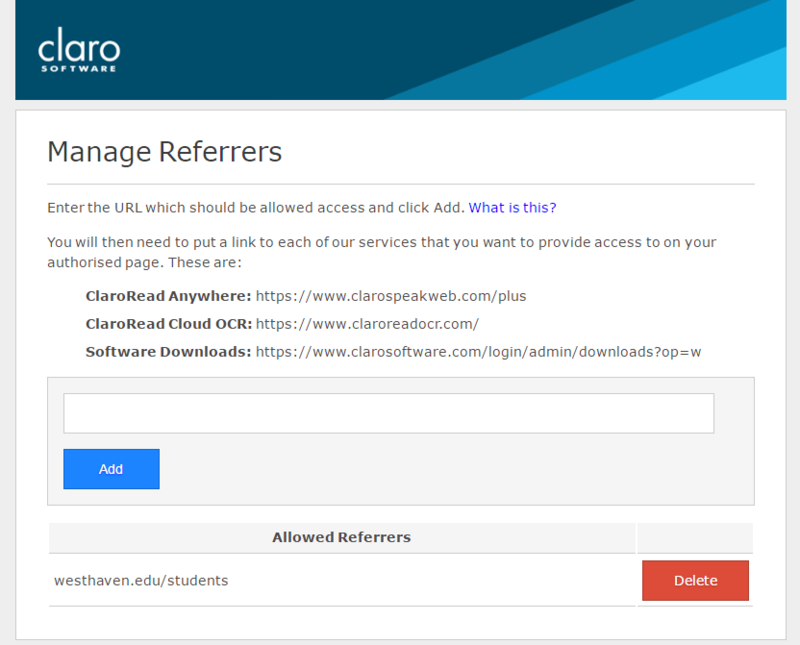 You can now simply give the username and password to your staff and students and point them at the ClaroRead Cloud login page at https://www.clarosoftware.com/login. When they log in they will see downloads and web apps but not all your admin functions.